This was my first visit to the Houston Food Park at 1504 St. Emmanuel. Not a lot of trucks there today but the one I tried was a real winner! It was great to meet Miguel Villegas and wish the venture well, especially since it will give me many tasty meals! Follow them on twitter (@Houfoodpark ) and patronize the park. 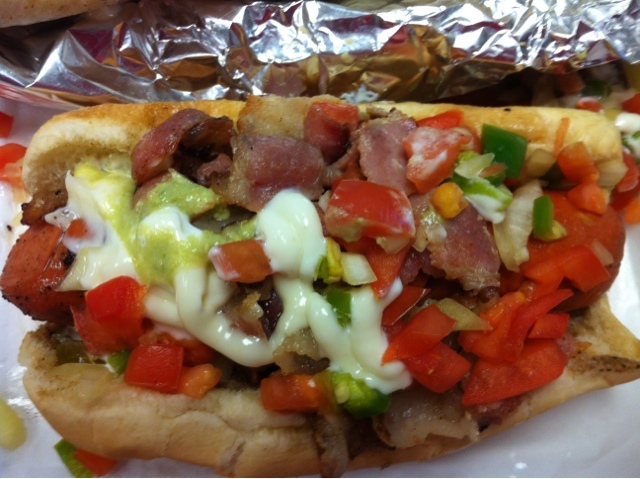 A good hot dog on a great bun covered in fresh pico-de-gallo, chopped bacon, and a creamy sauce. The sauce could have been mayonnaise, but the other flavors here made it hard to tell. The pico was great, enough kick from the jalapenos that you know they are there, but not enough to make me reach for the Zantac after lunch! A nice hot jumbo hot dog too. And what isn't better with lots of bacon on it. Synopsis: Do it simple and well like this you'll always have me craving another! A classic interpretation of the burrito. I chose beef as my meat. I was expected taco meat, but what I got was honest-to-god beef fajita! that's actual marinated and grilled skirt steak. This was chopped a bit and there was plenty of it. Real skirt steak is not melt in your mouth tender but not tough as leather either. This was as good as it gets, the little bit of chewiness giving me a few more moments to savor beef instead of wolfing it down. 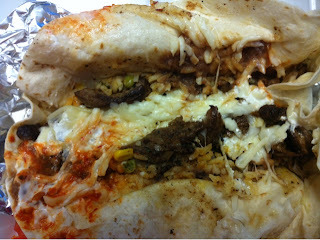 The rest of the burrito was re-fried beans, rice, and some hot sauce. Synopsis: Do a classic right like this and you don't need exotic ingredients to make something absolutely Delicioso! I have to say Juan and Melleson have a great truck going. Juan was very personable while I was waiting for my order and Melleson cranked out some awesome food. 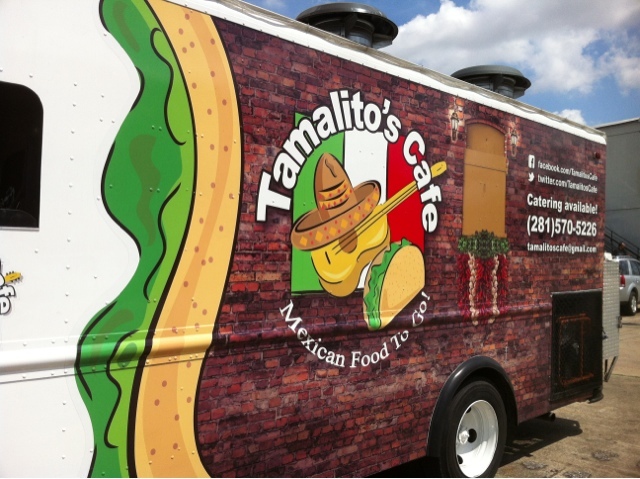 Too often I feel like I'm paying extra for the right to order my food in a steamy hot Houston parking lot, but not with Tamalito's. 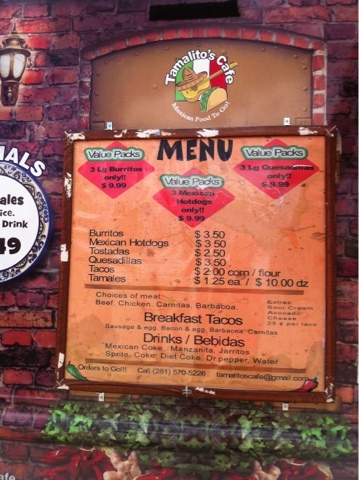 Check out the prices on their menu below, they are one of the most reasonably prices trucks in Houston.